We suggest that what was behind the Kumaratunge (VK) murder was not the presidential election several months away, but his support for the solution to the ethnic problem under the Indo-Lanka Accord. To attribute presidential rivalry as the cause of his demise is to trivialise the tragedy. He had almost no chance of becoming president in 1988. If power had been his sole aim, Premadasa would have welcomed him into the UNP. In pitting his charisma and popularity on the side of socialist ideals and a radical vision of ethnic harmony, he was going against the grain of Southern politics. This was his greatness. His base was again in the same poor working-class areas in which Premadasa had his, and in which Premadasa too had built up his following. It was here that the JVP too was recruiting. Neither Premadasa nor Kumaratunge sought to confront the JVP, which is fair enough. The JVP’s anti-Indian position was a recent volte- face – a quick means to power. The JVP had long maintained regular contact with the Indian High Commission (IHC) and its position as late as 1986 was that the Tamil problem should be resolved with Indian help. This link is not at all surprising in an underground party, which may any time need at least room for refuge in a neighbouring country. In 1987 Premadasa had also staked his drive for power on the anti-Indian cry, creating room for some temporary accommodation between him and Wijeweera, except that in the long run it had to be him or Wijeweera, not both. From about 1986, Premadasa’s rhetoric, according to watchers of the scene, was more notably populist, anti-elitist and finally anti- Indian. In the spring of 1986, Prime Minister Premadasa printed and sent Vesak cards from his family quoting the Buddha’s counsel to Mahanama against waging war, while his government was in the thick of one. Thus on the surface he was quite close to the JVP while distancing himself from rivals within his Party. No doubt this influenced the JVP’s apparently conciliatory approach to Premadasa and the latter’s opportunism was partly designed to court the JVP. Thus it made good sense for Premadasa to use his agents in the poor suburbs to keep him informed without confronting the JVP and to influence them to his advantage when an opportunity arose. Going by a fairly basic assessment of Premadasa’s politics, we have no doubt that this happened. Early 1988 was a time when a menacing conspiratorial atmosphere prevailed. The different actors had staked their futures in desperate actions and were undoubtedly prepared to do anything to ensure success. July 1983 gave us a good idea of what they were capable of. For Athulathmudali and Premadasa, success could only come from wrecking the Indo-Lanka Accord. Athulathmudali had already done a major wrecking job on 5th October 1987 with a bloody outcome (Sect. 21.2.5). Premadasa’s strategies were not of the quasi-legal sort as Athulathmudali’s. Premadasa had always taken an interest in Vijaya Kumaratunge’s activities, and Ananda Sunil’s fate was one instance of this interest. Sunil was known to be Kumaratunge’s man. The Commission has offered us testimony that Premadasa had watched Kumaratunge in his latter days, and his own political base where Kumaratunge was also active would have been a good source of information. This is normal when two politicians are in the same territory. The situation was, however, abnormal. A climate of terror destroys healthy values and restraints that prevail in normal times. When there are gunmen stalking about, it offers short cuts for the ambitious who see someone standing in their way, and not just among politicians. It is often the intellectuals, who are geared towards using such opportunities with greater subtlety. For example, in the case of the Tamil poet and dramatist Miss. Chelvi Thiagarajah who was detained and killed by the LTTE, those who campaigned most effectively against her were also literary figures who regarded her an obstacle to their pre- eminence. The device used was to go on putting it about in certain circles that Chelvi’s writings were “anti-LTTE”. The end of 1987 was also a time of rumours. VK’s position was a carefully thought out one. His party supported the Accord, but was opposed to the presence of Indian troops. His party also campaigned for lifting the ban on the JVP. But the reality was that VK was a challenge to those who had staked their careers on wrecking the Accord, and in the paranoia that prevailed, the challenge posed by VK would have taken on a new dimension. The Indian High Commission too, desperate in its own way, was sending messages to those on the Left who supported the Accord, and to intellectuals known to them who took a discerning approach to the Tamil problem. It called upon them to work with Vijaya Kumaratunge. There was also talk then that if the security situation in the South became desperate, the Indian Army would move in – something India was clear she did not want to do. Against this political maelstrom, it would have been easy to spread stories about individuals who supported the Accord that were likely to put their lives in danger. This was going on at various levels. As things developed even academics in universities in the South became paranoid about fellow academics who had a line to the JVP. If we are looking for motives, there is not only Premadasa, but several others whom Vijaya Kumaratunge challenged. There is also no evidence that Premadasa was in any way instrumental in VK’s death. Yet, in the prevailing atmosphere of violent hatred, some of his supporters could have done things that increased the danger to VK. There is also no evidence that anyone other than the JVP was responsible for VK’s death. But someone who knew Premadasa well, while saying that in his opinion Premadasa was not responsible, suggested that Premadasa may have known it was coming. This is very plausible. Everyone had his sources and information was flowing back and forth with added twists. 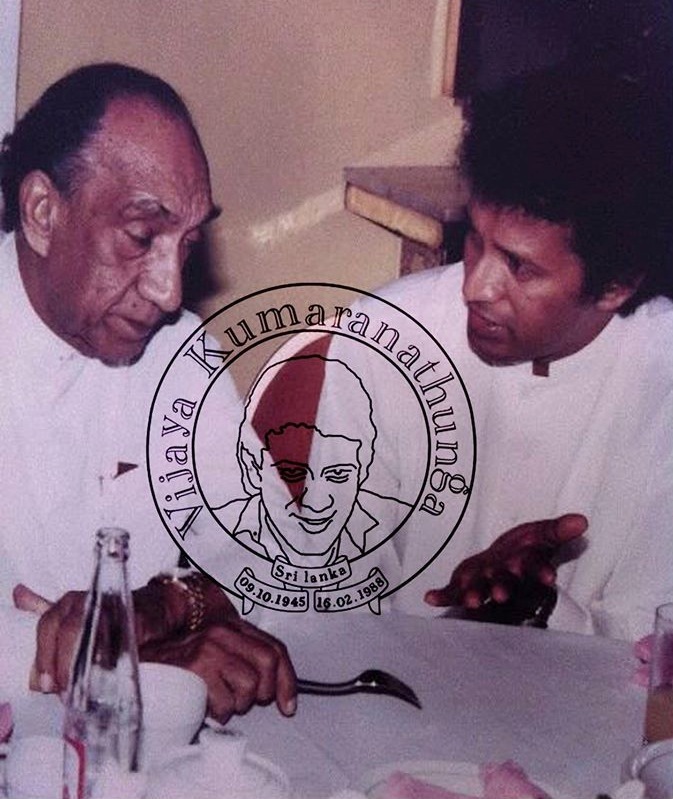 Premadasa had his lines to the JVP at one level and President Jayewardene who had his at a different level appears to have been getting information that Premadasa and Athulathmudali were orchestrating the JVP. More to the point are the five suspects detained shortly after VK’s assassination. It was again the kind of area where Premadasa would have had his supporters and a number of individuals who worked for the JVP would normally have been UNP supporters. If the connections of the suspects had been probed, it may have led to something embarrassing that was not directly connected to the murder. If Premadasa had interfered with the investigation, the reasons may have been similar to those for which Gamini Lokuge had declined to testify before the Commission. Where politics and the underworld mix, there are bound to be many surprises. This would also place in context the testimony of the retired Inspector U.A. Piyasena before the Commission. Piyasena had made a crucial contribution to the VK murder investigation. According to him, the CID director SSP Bennet Perera who was transferred out of the CID in February 1989, had advised him to lay off the VK investigation for his own good, and hinted that there were signals from ministers not to proceed.